Ear infections, also known as “otitis media”, are the most common reason children visit a doctor. Ear infections can occur in one or both ears. Ear infections are much more common in children than in adults. The external ear contains the pinna and the ear canal. The pinna is the outer-cupped portion that we see and touch. The ear canal progresses from the visible hole in the ear down to the surface of the eardrum. The pinna funnels sound into the ear canal. The external ear skin contains wax glands, which produce a waxy substance to protect the ear canal skin. The middle ear is the space between the inner surface of the eardrum and the hard bony wall of the inner ear. The middle ear contains the middle ear bones (hammer, anvil, and stirrup) and air so that the eardrum can vibrate when it is hit by sounds, like a speaker. The inner ear is encased in thick bone in the skull. It functions for our hearing and balance. It contains the cochlea for hearing and the semicircular canals for balance. 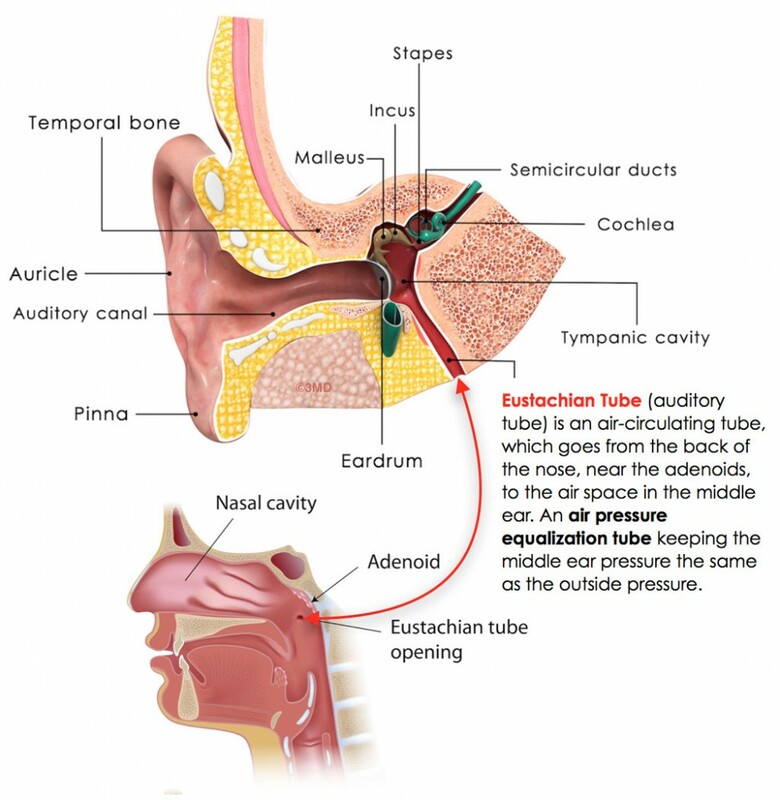 The “eustachian tube” is important in the development of ear infections. 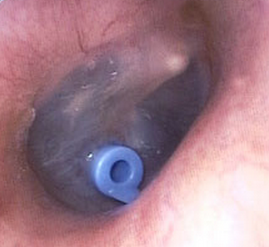 This is an air-circulating tube which goes from the back of the nose, near the adenoids, to the air space in the middle ear. The function of this air circulating tube is to keep the air pressure in the middle ear space the same as the air pressure in the outside world around us. For example, air circulates through the eustachian tube when we go up or go down in an airplane so that we don’t have pressure abnormalities and ear pain. When the eustachian tube is swollen shut and unable to circulate air, fluid builds up in the middle ear space creating otitis media. Ear infection means inflammation and fluid in the middle ear. 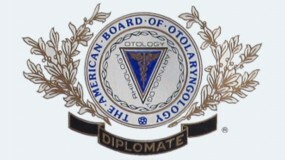 If the fluid in the ear is pus, it is known as “acute otitis media” (AOM). 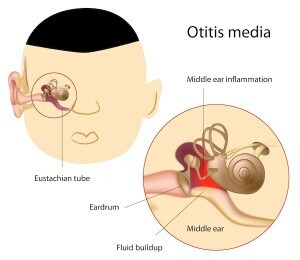 There is usually significant inflammation of the eardrum and middle ear space with acute otitis media. Water fluid or mucus fluid, which can be clear or opaque, colorless or colored, is known as “otitis media with effusion” (OME). There is always a period of fluid in the middle ear space, both before and after acute otitis media. Often after the acute otitis media has passed, the fluid in the middle ear space can last for weeks or months. This condition predisposes to more ear infections and can create hearing problems. The diagnosis of an ear infection is made by noting typical symptoms, listed below, and by examination of the ear. The middle ear fluid can be seen on examination because the eardrum is see-through. The eardrum may also be bulging. A pressure test of the eardrum, called “tympanometry”, can also be used to diagnose ear infection. 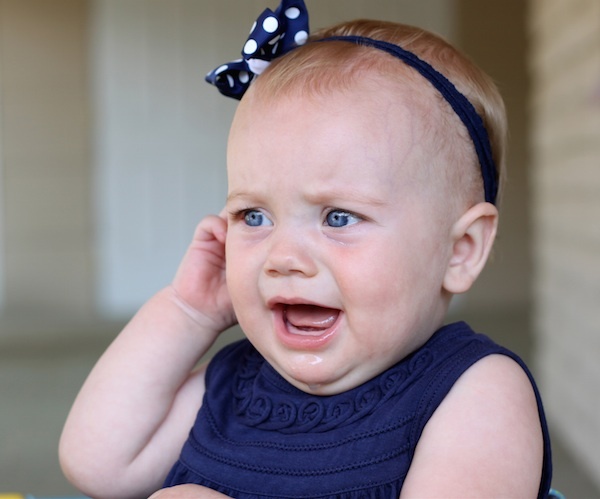 What are the Causes and Risk Factors for Ear Infections? The most common cause of an ear infection is the common cold. Studies show that in children between the ages of 6 months and 3 years, up to 30% of colds can be complicated by an ear infection. However, ear infections can occur even without a cold. The more ear infections a child has had, the more likely he/she is to have additional ear infections. There are several risk factors which are known to predispose children’s ear infections. These risks include children who have other family members who have a history of ear infections, parental smoking or secondhand tobacco exposure, drinking from a bottle or cup while lying down, and a previous infection known as respiratory syncytial virus (RSV). Children in daycare are more prone to ear infections because they get more frequent colds. Children who have a cleft palate, Down syndrome, or other craniofacial abnormalities are more prone to ear infections as well. Finally, in some children, the adenoids can become chronically infected and contribute to the development of ear infections. The most common symptoms of an ear infection include fever, fussiness, excessive crying, poor appetite, poor sleep, ear pain, hearing loss, and difficulty with balance. However, if fluid only is present (OME), the only symptom may be hearing loss, which children don’t often complain about. These symptoms should prompt a visit to the doctor. Without appropriate evaluation and treatment, an ear infection can cause long-term or even permanent hearing loss. Ear drainage and ear swelling can be symptoms of a complication from an ear infection. These symptoms require immediate medical attention. Whenever there is fluid of any kind (pus/water/mucus) in the middle ear space, hearing loss is present. In patients with frequent ear infections or persisting ear fluid, hearing loss can frequently lead to speech delay or learning capacity problems. Complications can occur from ear infections. These include high fever, hearing loss, eardrum perforation, bacteremia (bacteria gain entrance to other areas of the body), and other more serious complications. Symptoms or suspicion of an ear infection should prompt a visit to the doctor. Treatment for ear infections varies from measures to help reduce fever and pain, a period of watchful waiting, oral antibiotics or antibiotic shots, and ear tubes. It is always important to follow the doctor’s recommendations for treatment, and to schedule a repeat examination to be certain that the ear infection and ear fluid have been cured. Acetaminophen (Tylenol) or ibuprofen (Advil/Motrin) may be recommended by your doctor to reduce fever and/or ear pain. Often a warm towel or low-temperature heating pad applied to the ear can reduce pain. Sometimes prescription ear drops can reduce ear pain. Frequently, oral antibiotics are prescribed for an ear infection to help reduce the symptoms and the duration of the ear infection. Several different forms of bacteria commonly cause an ear infection, and the antibiotic medicine prescribed by the doctor is directed against these bacteria. Unfortunately, antibiotics don’t always cure an ear infection. 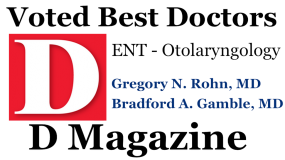 When children have recurring ear infections, multiple ear infections over a short period of time, hearing loss, or fluid that persists in the ears for 3 months or longer, they will often be referred for a consultation with an otolaryngologist (ear, nose, and throat doctor). Your doctor may discuss and recommend pressure-equalization tubes, commonly known as “ear tubes”. Ear tubes result in a decreased frequency of ear infections and resolve the middle ear fluid, which had been creating hearing loss. 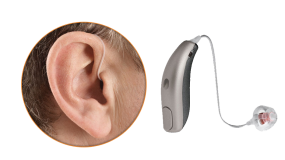 They function by circulating air through the ear tube into the middle ear space and preventing buildup of fluid. 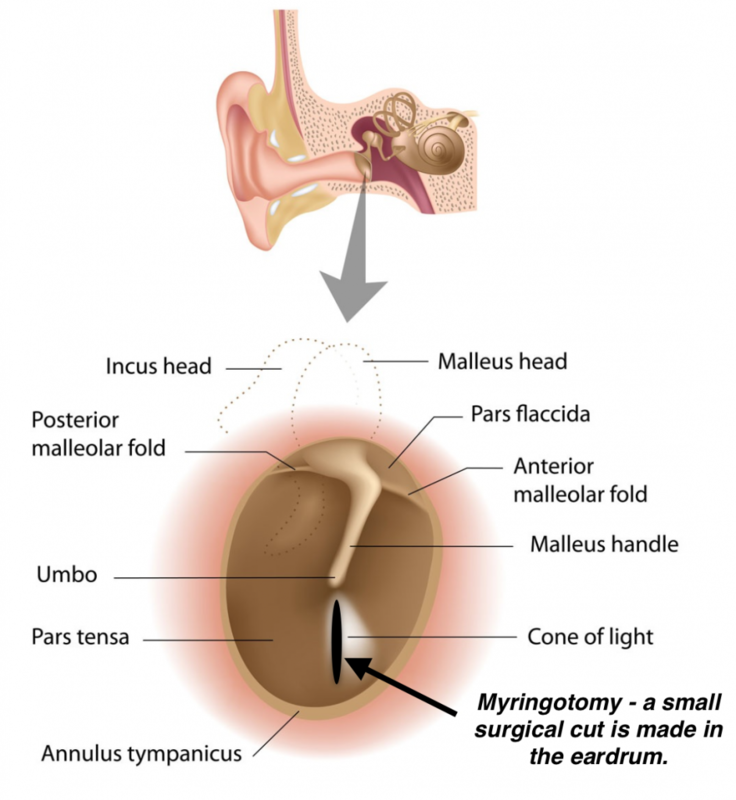 Ear tubes are performed in a very short surgical procedure called “myringotomy and ear tubes”. A small incision is made in the eardrum and any middle ear fluid, which is present, is suctioned out, and the tube is placed into the eardrum. Through the ear tube, ear drops can be applied to cure the middle ear inflammation and avoid exposure to additional oral antibiotics. The ear tubes will usually fall out after a period of time, and the eardrum heals. Audiologists, Mary Gamble and Lisette Jackson, Au.D., CCC-A and otolaryngologists, Dr. Rohn and Dr. Gamble of Otolaryngology Specialists of North Texas are highly experienced and uniquely qualified to identify a wide variety of pathology and underlying medical conditions of the hearing and balance systems. If you would like to schedule an appointment with our office, please call our Plano office at 972-378-0633 or Dallas office at 214-239-1641.